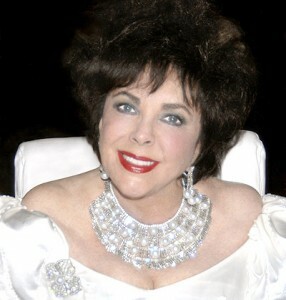 Elizabeth Taylor has reportedly left the bulk of her $600 million fortune to AIDS charities. The Hollywood veteran passed away on Wednesday after losing her long battle with congestive heart disease, sending the show business world into mourning. Frequently praised for her role as an AIDS/HIV activist, the star has continued her good work by leaving a large portion of her wealth to her beloved charities, reports The New York Post. That is so awesome. Liz Taylor, in her death, decided to put her money where her mouth is. For that I can only give her respect. Confession time: I have literally never seen a film that Elizabeth Taylor was in. Before you older readers go “Oh my god, that baby is ignorant!,” you have to understand that I never, ever see movies. I literally have not seen a movie all the way through in the past year, or more. It’s just something I don’t really do. I don’t even know how to work my television. Music? Yeah, I listen to Keely Smith and Blind Willie Johnson and Dolly Parton, so it has nothing to do with a generational thing. I just don’t watch movies. I may have never seen an Elizabeth Taylor film, but I also don’t know who any other current Hollywood stars are, besides maybe James Franco, because OMG. I have seen exactly one of his films, Milk, which was fine, but I only saw it because all the gays were watching it, and I ended up in a group of people one night who went to see it. It was okay. The only reason I point this out is to explain that I do not give a damn about Hollywood, so when I accord Liz Taylor respect for what she did in her death, it is in no way colored by any preexisting adoration. [Maybe I would love her work! Get me to sit down in front of a movie without getting up twelve minutes in to go find something more interesting to do, like laundry, and we’ll find out!] I mostly associate her with that creepy White Diamonds commercial that ran for many years after she plausibly looked like she did in said commercial. I simply respect the hell out of her for what she chose to do with her fortune when she died. That’s all.